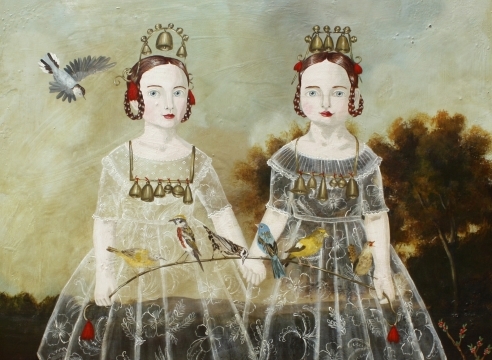 Anne Siems was born in Germany and received her MFA in 1991 from Hochschule der Kunste in Berlin. Her work shows a fascination with nature and the mystery of human experience. Figures are delicately rendered and embraced by flora and fauna, yet placed in ambiguous settings of time and space. Siems has exhibited in the United States since the mid-1980s, at galleries in Chicago, New York, Los Angeles, San Francisco, and Seattle. Her work is included in the collections of the Arkansas Art Center in Little Rock, the Boise Art Museum, the Tacoma Art Museum, Microsoft, University Hospital in Seattle and University of Washington, among others.